I can still remember the night John proposed. We’d asked my mom to baby-sit my son Cory, and then John drove me 70 miles away to a nice dinner. After that, we strolled in the moonlight at a local park. We laughed, talked, and joked. John even did a little song and dance, to my delight. Then, he led me toward the light of a streetlamp and he knelt on one knee, produced a beautiful ring, and asked me to marry him. Ahhh . . . Even though we live 1,000 miles away now, we’ve been back to visit that park. A huge bridge crossing the Sacramento River has been erected on the very spot he’d proposed. As we gazed at it, once again in the moonlight, John whispered in my ear, “It’s only right that such a beautiful structure be erected as a monument of our love.” Double ahhhh . . . The longer I’ve been married, the more my idea of romance has changed. Sure, I still enjoy dinner out and walks in the park, but my face really lights up when John sees me in the kitchen and helps me with dinner, or when he picks up Mr. Clean and spends 45 minutes on a Saturday morning making our bathroom shine. Those things mean a lot to me because John sees my need and strives to alleviate some of the work that comes with raising kids, writing books, and serving in church. Likewise, John appreciates it when I curl up next to him on the couch during a movie . . . especially if it’s one I wouldn’t choose to watch. Or if I take him a sandwich while he’s working in the garage. Or if I give him a massage after a long day at work. Romance doesn’t have to fade away with the years. With or without kids, romance can flame, spread, and provide a fire in the hearts of mates. Yet romance doesn’t have to be trite. True romance impacts the deepest part of our heart—where media, movies, and love songs can’t possibly touch. Last January John and I started the year by running away together to Banff, Canada (which is only four hours away). We found January worked well for us, because I’m usually tired from balancing kids, book deadlines and holidays, and John is tired from end-of-the-year crunch at work. We had the best time together: sleeping in, going on walks, bubble baths, talking . . . you get the picture. We liked it so much, we are hoping it turns into a yearly event! I love how this author urges readers to go beyond remembering to reflection. Don’t keep your warm thoughts to yourself. Speak them to your spouse. Also, speak them as thankfulness to God. Apostle Paul says, “Every time you cross my mind, I break out in exclamations of thanks to God,” Philippians 1:3 (NIV). Can you imagine how much love we’d feel toward our spouse if we did that? Can you imagine how loved we’d feel if our spouse did the same? Make my joy complete by being like-minded, having the same love, being one in spirit and purpose. Do nothing out of selfish ambition or vain conceit, but in humility consider others better than yourselves. Each of you should look not only to your own interests, but also to the interests of others. Your attitude should be the same as that of Christ Jesus. Jesus gave everything . . . to show His love. Thinking of this, I realize that giving a back rub doesn’t sound too difficult. Marriage is such a blessing, but it can be hard sometimes. 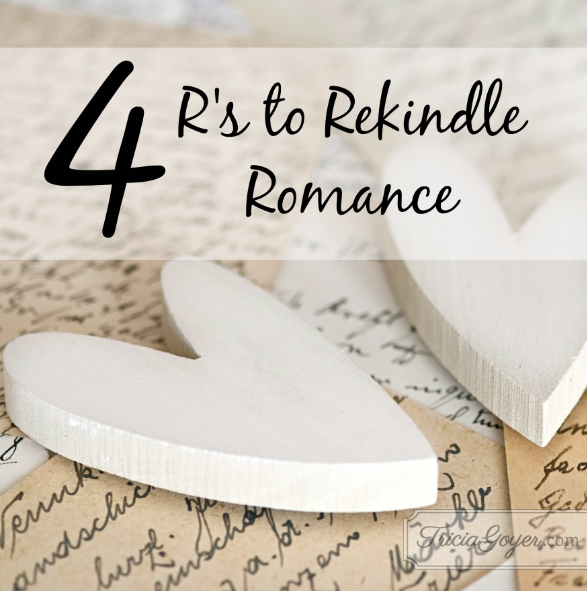 It’s easy for me to slip into a routine and forget about keeping romance alive. Help me take time and energy to plan special moments with my husband and let him know how much he means to me. Continue to bless our marriage and guide us closer together and to you.